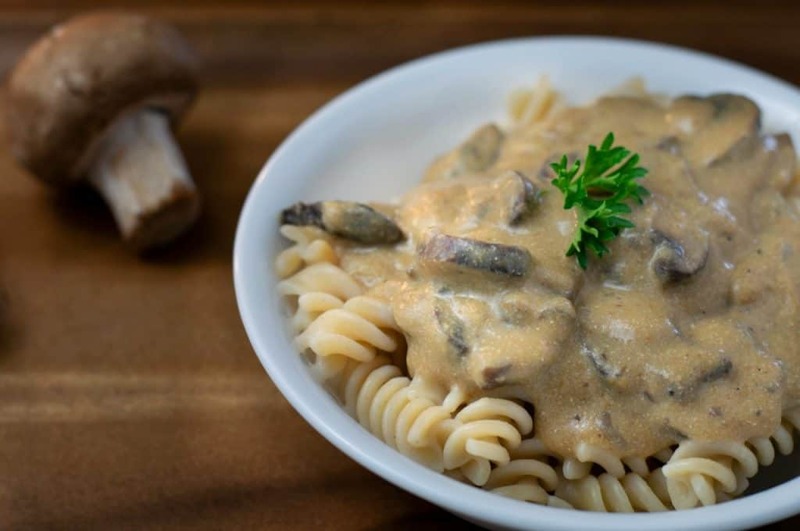 This recipe is a hack of my already popular Creamy Mushroom Stroganoff. Why change it you ask? I made it EASIER, and in my opinion, even tastier. 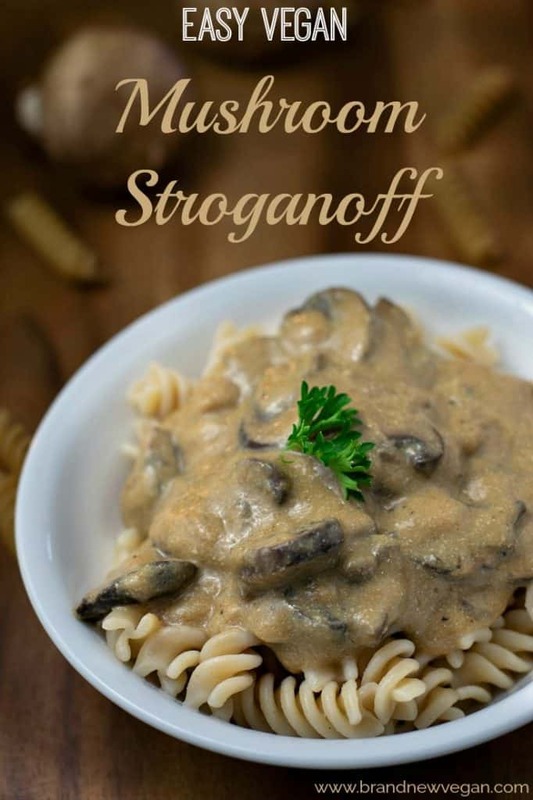 So if you love Mushrooms and Pasta smothered in a rich, savory sour cream gravy – give my new Easy Vegan Mushroom Stroganoff a try. I know right? Why didn’t I thik of this before?? The only part of this recipe that takes any real time is boiling your pasta and sauteeing your mushrooms (which can be done simultaneously). So…..what…..another 12-15 minutes? A super yummy, low-fat, savory comfort-food dinner in less than an hour? Is that easy enough? I’ll list all the ingredients in the recipe box below, but basically, you whisk all the dry ingredients together and then lightly toast them in a pan over medium-low heat. Give the dry gravy mix a stir every so often and when it starts to smell like toast – we’re ready for the liquid. Just whisk all the wet ingredients together (I do it right in my measuring cup) and then pour it into the pan, whisking the wet and dry together. Be sure and mix up any dry clumps and make it as smooth as you can. It will thicken as it begins to simmer – keep whisking, scraping the bottom of the pan and when it reaches a gravy-like consistency – remove the pan from the heat and set it aside. Next, I drained a 16 oz package of Tofu (I used extra-firm) and then just dumped the whole block into my blender. Add the rest of the sour cream ingredients and blitz until it’s nice and smooth. Scrape down the sides if you need to. Finally, chop up about a pound of Portobello Mushrooms and add them to a large frying pan. Mushrooms will release their own water so there’s really no need to add any liquid – but I did add 1 tablespoon of Low Sodium Soy Sauce and 2 tsp of Vegan Worcestershire for flavor. You can also start boiling your pasta about now – I like Brown Rice Pasta. Keep stirring the mushrooms and you’ll see the pan become very wet from all the liquid that’s released. It will eventually evaporate and once the pan begins to look a little dry – and the mushrooms have shrunk in size – pour that gravy in here with them. This alone would make an awesome mushroom gravy, but to take it one step further…. Once you’ve mixed the gravy and mushrooms together, go ahead and stir in some of that sour cream. The sour cream recipe I list will make about 2-3 cups and you won’t need all of it – so refrigerate the rest for those baked potatoes or tacos. But for this sauce, I used about 1/4 cup to 1/2 cup (more or less) to give it just the right tang for my stroganoff gravy. Adjust to your own taste. Don’t forget to season with salt and pepper to taste, and then pour it over that pasta you just drained. Mmmmmm. 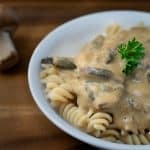 Homemade Easy Vegan Mushroom Stroganoff. That’s it for this week, keep those comments coming and we’ll see you back here next weekend for another BNV Comfort Food classic. I made this popular recipe even EASIER (and in my opinion even tastier). So if you love Mushrooms and Pasta smothered in a rich, savory sour cream gravy – give my new Easy Vegan Mushroom Stroganoff a try. Whisk all wet gravy ingredients together and pour into pan with the dry ingredients. Whisk until smooth and heat until thickened – set aside. Add soy sauce and Worcestershire and stir over med heat until mushrooms have reduced in size and the liquid has evaporated. Stir gravy into pan with mushrooms and mix well. I haven’t made this particular recipe, but wanted to say that I prefer my stroganoff with jasmine rice. I don’t like noodles with stroganoff at all. 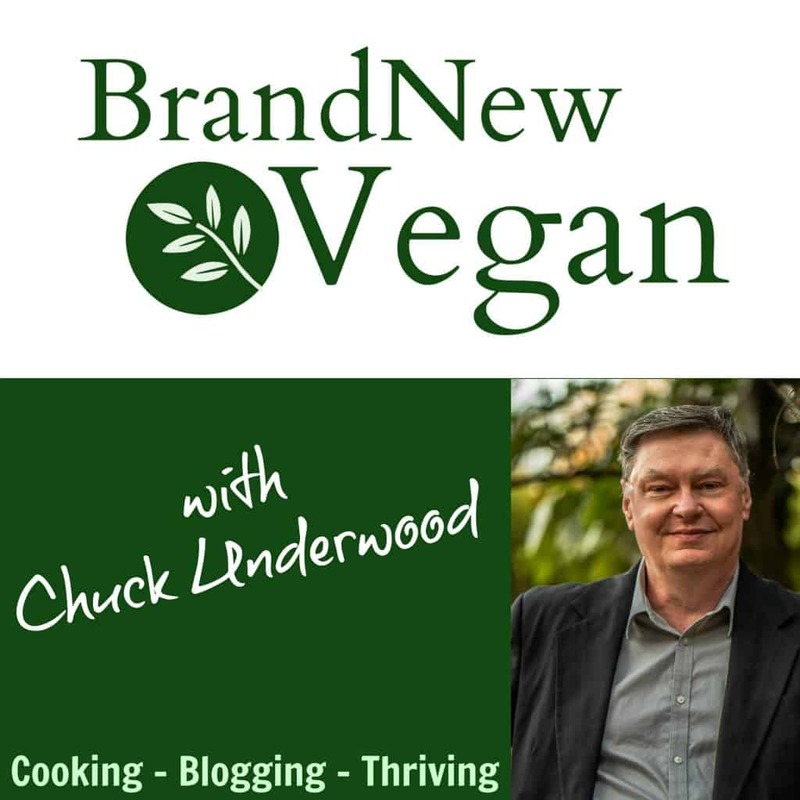 I love your videos, love your website, love your recipes, however I really prefer the videos you have without the background music…….in case you are interested. I just made this today. It was super good. Thanks! Excellent flavor and satisfying meal. My lifetime-carnivore husband loved it! Plus, it was easy. I think I’d like a good splash of red wine in the flour base before adding the broth for the gravy recipe. I’ve been vegan for almost 2 years, but there are some things I still miss. This has solved one of my problems. It was absolutely delicious! Any substitute for Worcestershire sauce? Can you use silken tofu? I really liked this. I am it sure if I did something g wrong, it was very salty. This post was perfectly timed! I subbed white mushrooms and silken tofu because I had them on hand. I checked the older stroganoff recipe and saw you used silken in that one so figured I’d be safe with that substitution and it was. Oh my, this was the best! I’ll definitely make this again! And I’ll make your sour cream one of my staple recipe! Thank you!